Wow ... Amazing and Interesting: Biggest earth-monitoring satellite likely "dead"
Biggest earth-monitoring satellite likely "dead"
PARIS: The European Space Agency said Thursday it had lost contact with Envisat, the biggest Earth-monitoring satellite in history. Designed to operate for only five years, Envisat was launched in March 2002, carrying 10 instruments to monitor the planet's oceans, ice, land and atmosphere. The giant 8.2-tonne, 10.5-metre (34.1-foot) craft carried on working for a decade, racking up a total of 2.25 billion kilometres (1.4 billion miles), or more than 50,000 orbits, ESA said. The satellite failed to make a radio call on April 8 as it passed over a ground station at Kiruna in Sweden, the agency said. It has assembled a "recovery team" of engineers, flight dynamics scientists and mission operators in the hope of restoring contact with Envisat, which remains in a stable orbit. 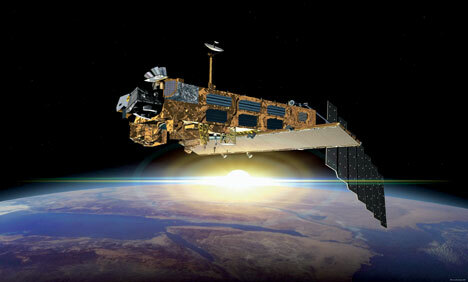 Envisat's data has been used in 4,000 science projects in 70 countries, including landmark research into climate change. Its study of ocean currents was used last year to simulate dispersal of nuclear pollution from the Fukushima accident, and it gained real-time images of the BP oil spill in the Gulf of Mexico in 2010. It has also been an important tool in tackling illegal fishing.